Choosing a Halloween outfit that can be re-purposed for winter wear. With Halloween fast approaching, it is time to make sure Boo has her outfit. This year I am in a bit of a quandry and I need your help! We have a bit of a tradition in our household:fancy dress for Boo. Boo bear gets dressed up if there is even the mere whiff of an event. And the events that require fancy dress, are the ones we love the most. When Boo was a baby, I was happy to buy a costume from Amazon as she got through clothes so quickly then anyway and she would almost always be indoors. 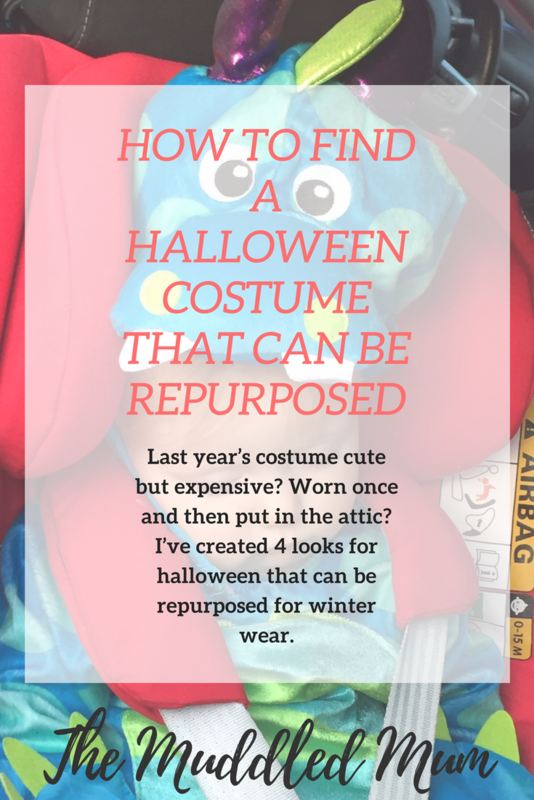 Now she is a bit older, I have been looking for an outfit that can be worn after Halloween but still makes a great costume (maybe I am starting to get more frugal …. probably not, sorry M). I also want her costume to be warm as this year she is finally old enough to go trick or treating! I am so excited! Firstly, I should ‘fess up. I am obsessed with foxes. They are so cute. Boo hasn’t had a foxy outfit for ages so when I saw this I immediately tried to think of an excuse to buy it! Just look at this super cute fox hat isn’t it amazing! Not only that, but there are matching fox gloves and my absolute favourite (I squealed! ), these fox wellie socks. The added benefit of this outfit would be that I could make the rest of the outfit myself. I love adding handmade touches to an outfit. I’m already planning ways to make a fluffy tail! Trouble is, this outfit is starting to add up in price so I am hesitant. But, my goodness, it is so cute. The next option I am quite excited about because it is in the boys’ section. That may sound weird, but I love finding clothes that Boo can wear that don’t fit typical gender expectations. I think it’s empowering to raise girls to know that they can be whoever they want to be. This Cath Kidston Dragon Jumper is so much fun and there is a long sleeve dragon t shirt that goes with it. Boo adores dragons and I can already picture her walking up to doors and shouting ‘ROOAAAARRRRRR’. It’s adorable, right? Trouble is, Boo was a dragon last year. Can I do the same theme 2 years in a row?! The next idea is from H&M. I’m not a big fan of their adult clothes despite my insta feed being full of mums rocking their floral prints. I look like a table in their dresses. An actual table like you would find at your grannies house: wide and covered in doilies and a 70’s tablecloth. Anyway, their clothes may not suit me, but I love their kids and baby section. They are reasonably priced and good quality – even stocking an organic range for babies. The moment I saw this dress, I wanted it. Well, I wanted it for Boo. It has pom poms! Yes, I know, I already have enough items of clothing with pom poms, but none of them are a pom pom dress with mini monsters. Seriously, go check it out it is so adorable. They also have these skeleton tights that would ensure this outfit is firmly in the Halloween category. I couldn’t look for an outfit without going back to the trusty Amazon Prime. Seriously, how would I manage without Prime?! Boo is obsessed with Pandas and this fleece panda romper looks so warm and cosy. I know she would love wearing it at home on lazy Sundays. So those are my options, I mean, Boo’s options. Obviously, I want to buy them all but that wouldn’t be financially responsible. What would your choice be? Have you seen any other cute outfits or accessories that could be re-purposed after Halloween? Let me know in the comments!